This low, fat, bowl-shaped garden planter has two decorative handles attached which adds a decorative touch with lovely detail. A large enough a bunch of colorful flowers or a small succulent garden. Perfect for a tabletop centerpiece, or sitting on a patio side table where you want color, beauty, and function. Hand-painted Talavera pottery has been well known for years in the pottery industry. 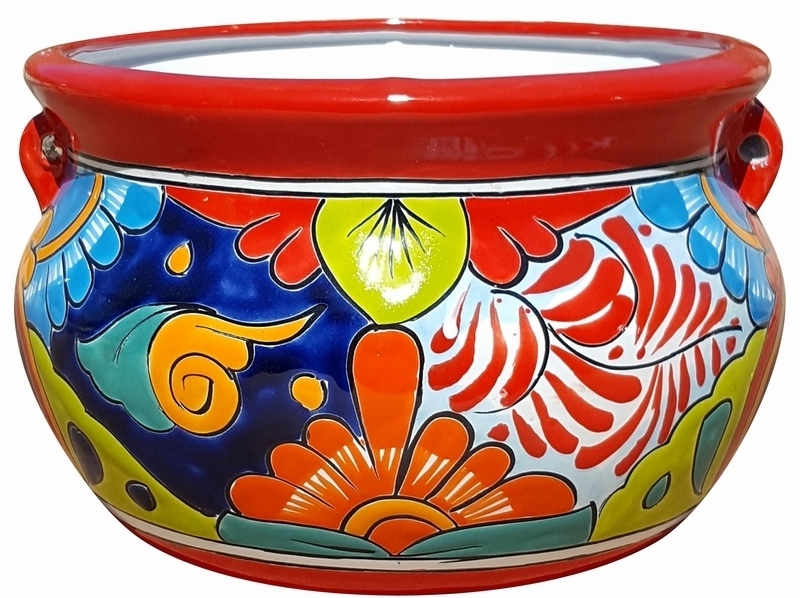 Imported from Mexico where artisans create original designs and hand paint each item painstakingly. Each pottery piece will be unique and original. No two pieces will ever be identical. Tip: We recommend if using outdoors you cover this piece with furniture wax to help retain the color and reduce crazing. Traditional Pattern with Red Rim.